You are taking your first step towards your renovation: figuring out the budget. Figuring out the budget and sticking to it can be one of the most stressful parts to a renovation, but it is necessary. 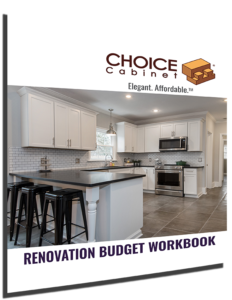 To help ease the stress of figuring out the budget, we have created a Renovation Budget Workbook. Our Renovation Budget Workbook is filled with valuable information, such as tips for budgeting and planning. We have also included tools to help you design and manage your renovation project. In order to download the Renovation Budget Workbook, please provide us with a little information about yourself and click “Submit”. You will be on your way to your renovation project! Only fill out this portion if you would like to be contacted by Choice Cabinet. This information is used only by us to better serve you.